Title [Aerial view of Seals Stadium] [graphic]. Reproduction Rights Permission to use this image must be obtained from the San Francisco History Center, San Francisco Public Library. S.F. News photo by George Place. Notes on back: And this is how it looked from upstairs. 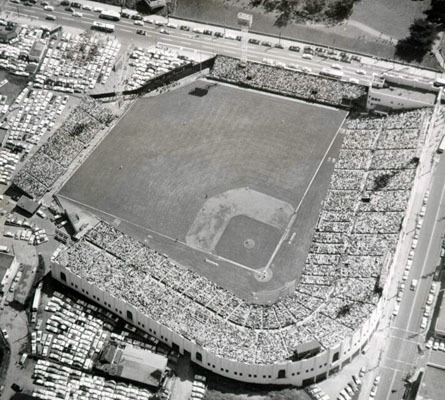 Something different in baseball pictures is this aerial shot of jam-packed Seals Stadium as 23,448 fans saw Giants clobber Dodgers in the big league opener. (News Photo by George Place), 3x5", 1/4 reduction.